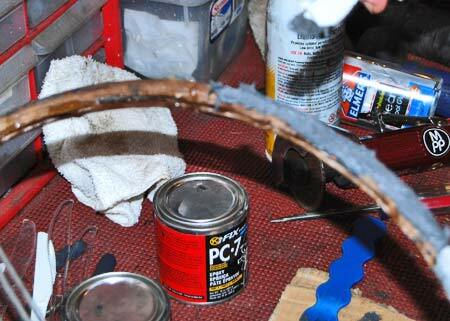 Be sure to see How to Make Your Own Wood Steering Wheel and Plastic Steering Wheel Restoration. The Daimler SP250 (aka Daimler Dart) is a low-production British sports car of the late '50s/early '60s with a 2.5-liter Hemi V-8 engine, a fish mouth fiberglass body with tail fins and Triumph TR3 underpinnings. According to online research, this car was available with either a standard or Deluxe steering wheel. The leather-covered Deluxe three-spoke wheel is an adjustable version with "banjo string" spokes arranged in a "Y" pattern. The circular rim has a steel inner core with a black plastic outer shell that has "finger bumps" along the bottom. The leather cover on the Deluxe Daimler steering wheel is wrapped around the black plastic outer shell and was probably glued in place, as it has no stitching along the seam on its inner side. There are also leather gaiters, in a matching color, that cover the bright metal spokes and mated with the rim cover on the outside spoke joints. These gaiters have a rectangular inner leather liner that adds strength and also wraps the spokes. There is no stitching on the bottom seams, so these were probably also glued in place at the factory. 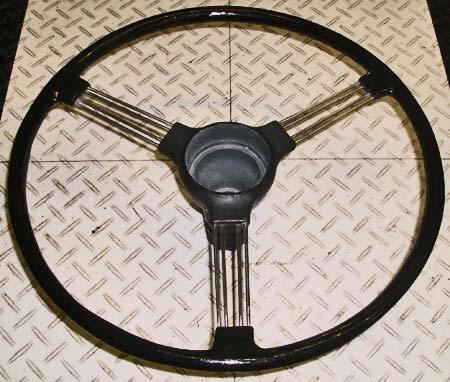 The standard Triumph TR3 steering wheel is available as a reproduction from Moss Motors (www.mossmotors.com) and probably will work on a Daimler SP250, but it does not have the proper "Y" spoke pattern for the Daimler. The Deluxe adjustable wheel is not reproduced. If you have a Daimler with a Deluxe steering wheel that has deteriorated (which is very likely) and you want to restore the car to factory condition, restoring the steering wheel may be your only option. Since classic American cars often used banjo steering wheels, the process of restoring such a steering wheel might be of interest to many enthusiasts. At first glance, the SP250 steering wheel seen here looked pretty much unrestorable. It was first taken to a shop that specializes in this type of work and they said it could not be restored. Next a No. 52196Z Steering Wheel Restoration Kit was purchased from Eastwood (www.eastwood.com). Catalog copy said the PC7 2-part epoxy filler in the kit could be used to repair "cracks in hard plastic and Bakelite for steering wheels needing major repair." The $50 kit also included SEM Plastic Adhesion Promoter and a Steering Wheel Restoration Handbook. 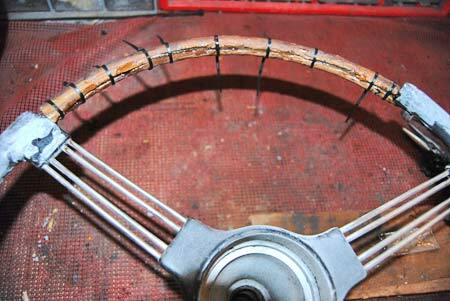 Daimler SP250 steering wheel had not aged gracefully. Two experts felt it could not be restored. Note the remains of the original rim and spoke covers. When the Daimler steering wheel was stripped of its leather covers, it looked pretty ugly. The spokes and metal core were very rusty and the black plastic rim was lightly cracked and crazed around two-thirds of its circumference. The remaining one-third was either not there or so badly cracked that there was no way to patch it with an epoxy. The only thing to do was the remove that section, tape the rest of the wheel and clean the steel core and the spokes with aluminum oxide media in a blasting cabinet. After some gentle blasting, the spokes cleaned up very nicely, using a wire wheel on a grinder to do the center section and a rotary tool with a wire brush to burnish the inner and outer ends. When remains of leather cover were removed deep cracks in the rim were revealed and approximately one third of the plastic rim was entirely missing. 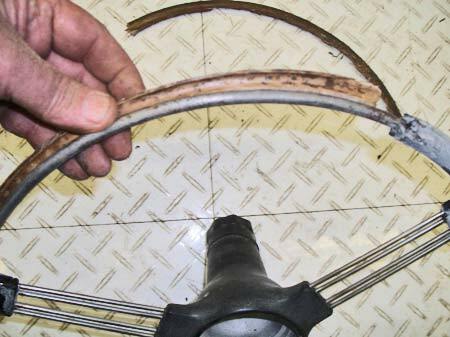 Removal of the leather spoke covers revealed rusty metal spokes and beat up outer spoke joints with bulging caused by breaks and cracks. The black plastic used for the rim appeared to be Bakelite and even the savable two-thirds had small cracks and crazing everywhere. The inner spoke joints at the center hub were in good shape, but it was obvious that the outer joints take the most abuse when the driver of a sports car "leans into it." The twisting and flexing—along with just aging—had taken its toll. All three joints were misshapen in different ways and had cracks and bulges caused by cracking. A few of the banjo string spokes were slightly loose due to joint cracks where they entered the plastic. The edges of several joints where they met the spokes had crumbled and revealed the ends of metal support plates. It didn't seem possible that the two-part PC7 epoxy in the Eastwood No. 52196Z Steering Wheel Restoration Kit could be used to replace as much as one third of the plastic rim and reproduce the finger bumps on the bottom of the rim. 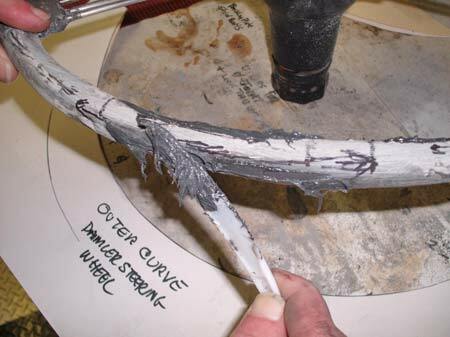 Since the steel inner core was still in robust condition, it was however somewhat conceivable that a new rim could be shaped with the putty, but how could the gripping bumps on the underside be reproduced so they had a uniform pattern? A phone call was placed to Eastwood's Joe Richardson to see what he thought. Jesse Gunnell used duct tape to cover repairable sections of the wheel before cleaning the rusty spokes a steel rim core in a media blasting cabinet. Richardson is a Product Specialist at Eastwood. He asked for email images of the steering wheel and was sent pictures showing the wheel as it looked before the leather cover and the heavily fractured third of the plastic rim were removed from it. "I'm sorry to tell you that, unfortunately, our restoration kit cannot be used to repair a steering wheel rim that has deteriorated so badly," Richardson said in his email. The kit certainly didn't seem like the right approach, but the photo on the cover of the Steering Wheel Restoration Handbook that came inside the kit was kind of intriguing since it showed a photo of the same steering wheel (probably from a TR3) in half-restored condition! This seemed like a secret message saying the Daimler steering wheel could be repaired, but how? Hidden message or not, it seemed at first that casting a new rim section out of some type of plastic might be the only way to repair the steering wheel. An internet search under "casting a steering wheel" turned up a Michigan company called Alumilite Corp. (www.alumilite.com) that sells resin-casting supplies. 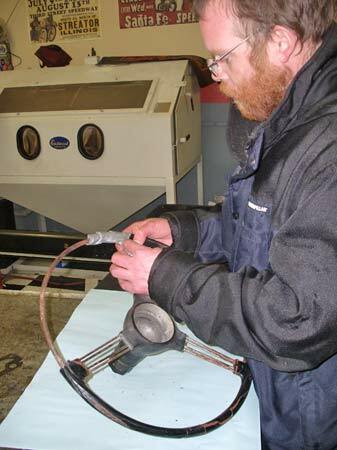 Emails to Alumilite brought information on how to mold and cast an antique car steering wheel rim out of resin plastic. Step-by-step photos depicted the mold making and casting process and the result was a great-looking white plastic steering wheel. However, it was 100 percent plastic and had no steel core. It seemed like a core-less steering wheel wouldn't have the strength needed in a high-performance sports car application, so Alumilite was contacted to ask if the resin casting process could be used to cast one third of a rim if one of the other sections was good enough to use for making a mold. Alumilite said this would be possible, but indicated slightly different techniques were required. 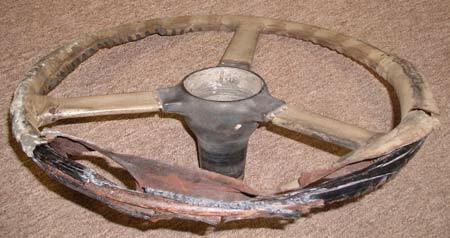 Ultimately, the Daimler wheel was restored by cannibalizing sections of another steering wheel. 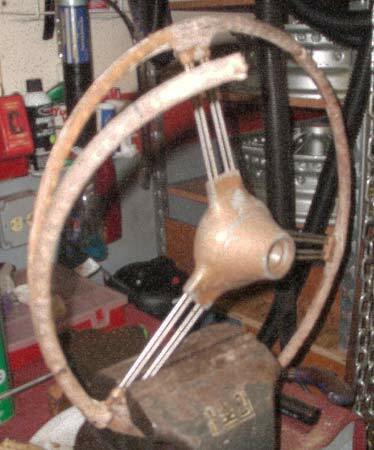 It seemed best do the job this way, then later use the Alumilite casting process to try to restore the steering wheel being cannibalized. The donor wheel came from an MG TD and the material that the rim is made of looked like wood, although chances are it is actually some type of plastic used in the early '50s that takes on a wood-like character as it ages and deteriorates. Many TDs at shows have aftermarket wood wheels. The Original MG TD (http://www.mgcars.org.uk/mgtd/mgtd_nitty.htm) says a tan marbleized rim is correct. Kimble Engineering (www.johnkimble.co.uk) reportedly has the original mold tooling and reproduces steering wheels with original materials. Whatever it's made of, the donor wheel was in sad shape. Recasting the entire rim seemed like the best approach to fixing it, but the rim shape and size and the finger bump pattern on the bottom seemed to closely match those of the Daimler wheel. 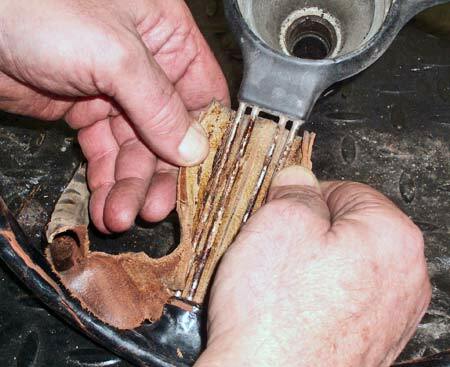 A cutting wheel on a Dremel tool was used to slice an approximately one-third section of the deteriorated MG TD steering wheel rim into top and bottom "shells' with the finger bumps on the bottom. These shells were then sandwiched around the bare section of the Daimler rim and trimmed to length. 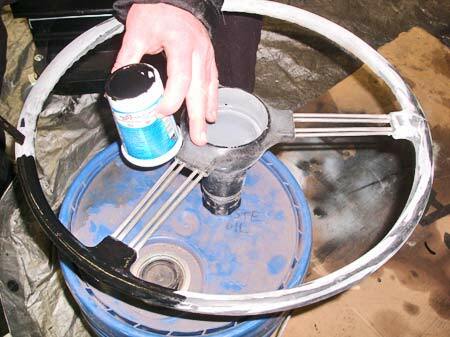 A store-bought two-part clear epoxy that squirts out of a double-barreled syringe-like container was used to glue the shells to the steel rim. Then electrical ties were wrapped tightly around the sandwich to hold the shells in place as the epoxy glue dried. 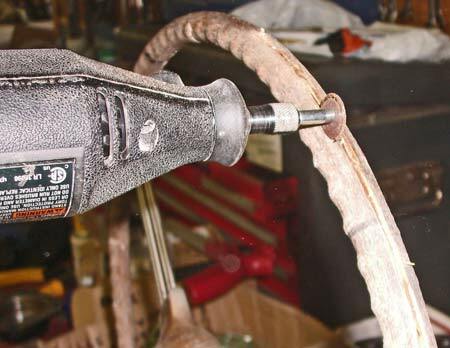 Cutting disc on a Dremel tool was used to cut the edges of an old MG TD steering wheel to create two "rim shells" to transfer to the Daimler wheel core. 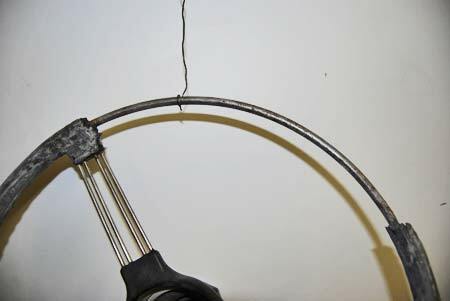 The two one-third sections of the "rim shell" were carefully pried off the rusty steel core of the MG TD steering wheel with a small screwdriver. The steel core of the rim was blasted clean. The banjo spokes were blasted and then wire brushed to make them shiny, A clear coat will be applied. After removing two sections of the MG rim (one with finger bumps) they were trimmed to the proper size to fill the missing section of the Daimler wheel. The two halves or "shells" were glued to the Daimler's steel rim core with a 2-part epoxy and electrical ties held them together while the glue set up. The MG TD rim had the same basic curvature, shape and design as the Daimler's black plastic rim, but was thinner. This meant there was a gap or slit between the shells on each side that had to be filled. In addition, the rim thickness needed to be built up. After the glue set up, the PC7 epoxy from the Eastwood steering wheel restoration kit was used to fill the side slits and then thicken the rim. Cardboard patterns were made to get the inner and outer contours correct. Holding the patterns against the rim showed where the filler was low and high. 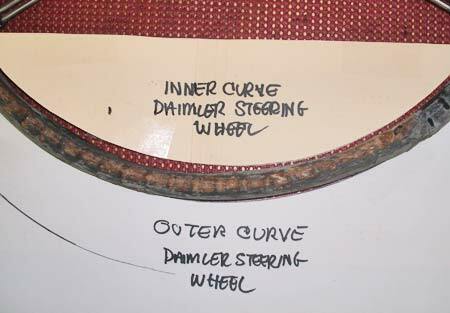 Cardboard patterns were made from good sections of the Daimler rim to check the curvature and thickness or rim. Patterns hit first on high spots. A black Sharpie® marker was used to indicate the high and low spots on the rim. Then the PC7 filler was sanded accordingly. Each application of filler required about 24 hours of drying time, before it could be sanded. The initial sanding was done with rough 40-grit sandpaper. Once the high and low spots were evened out, increasingly finer grades of sandpaper were used to gradually make the rim surface smoother. Sanding the epoxy off the finger bumps was hardest and a rolled up piece of sandpaper worked best for this. The sanding took hours and the restorer came to "know every finger bump by its first name!" High areas of the rim were indicated using a SharpieÂ® and then lots of additional sanding was done to shape and smooth the rim. PC-7 epoxy filler from Eastwood Steering Wheel Restoration Kit was used to fill in the side gaps and the build up the sides and top of the MG rim section. A second epoxy filler called J.B. Weld (www.jbweld.com) was used to repair the cracks, breaks and bulges seen at the outer spoke joints. This product is a bit more fluid and known for its great strength. When tried on some larger craters in the plastic rim, it tended to sink into the holes, but its fluid nature and strength were just right for rebuilding the spoke joints where some flexing is inevitable. Since the deluxe version of the Daimler Wheel uses a leather cove, refinishing the rim is not an absolute necessity. However, if it were to be left in "standard" form, the rim would be black plastic or an original deluxe wheel would be black plastic under the leather. Therefore, the final step of this project was painting the rim. Eastwood's Gloss Black Ceramic Engine Paint had been used on the car's engine and seemed like just the right paint for the steering wheel rim. Ceramic paint requires use of a 4:1 Urethane Activator. It was brushed on, sanded and re-applied several times until the proper appearance was achieved. Four parts of Eastwood Gloss Black Ceramic Engine Paint to one part Urethane Activator were mixed up in yogurt container and brushed on the rim. An English firm called KR Classics (email: rrogchaplin@aol.com) offers a custom-made, lace-on leather steering wheel cover for the Daimler SP250 steering wheel. Roger Chaplin says he can also provide pieces of matching leather to customers wanting to make the factory-style spoke covers from their own patterns. The KR Classics covers look great and come in a wide range of colors, but differ in detail from the factory covers, which were not of the lace on style. 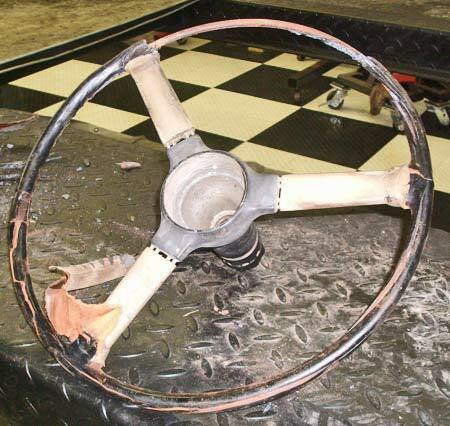 The restorer of this steering wheel has not decided whether to use the KR Classics product or to try to make his own. In either case, the addition of the leather rim and spoke covers will make another article for another day. Restored Daimler rim with J.B. Weld used to strengthen spoke joints and Eastwood Ceramic Engine paint on rim. Leather covers will be added later.